Spring weather brings April showers — leading to May flowers! But there are many other wonderful things about springtime besides refreshing rain and beautiful blooms. Just like summer offers swimming weather, fall brings colorful foliage, and winter ushers in snow, there are some amazing phenomena generally unique to spring that you’re sure to love. Have you ever seen the springtime cherry blossoms? Or the flurry of baby animals taking their first breaths of life? #1 — Cherry Blossoms Bloom In Washington, D.C.
Cherry blossoms adorn Washington, D.C. in a gorgeous coverage of bright white and pale pink flowers blooming from thousands of trees throughout the National Mall. Peak cherry blossom season is usually in early April. Though some years, peak blooms are in late March and even into the second or third week of April, depending on the late winter and early spring weather temperatures. 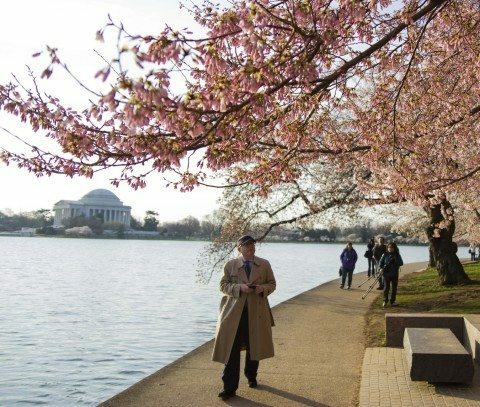 The peak cherry blossom period generally lasts anywhere from about 6 to 14 days — depending on temperatures, rain or snow, frost, wind, or other variables. Did you know? Japan gave Washington, D.C. a gift of 3,000 cherry trees in 1912 as a diplomatic gesture of friendship. Today, nearly 4,000 cherry trees in a dozen varieties grow on land owned by the National Park Service. When ospreys take flight, you can pretty much rest assured spring has sprung. Ospreys are big birds with distinctive calls. These birds of prey have wingspans of 4 to 6 feet, and they’re mainly found along the coastline of the Eastern United States from Florida through Maine. While these beautiful birds are relatively easy to find, they’re considered endangered, threatened, or of “special concern” — classifications that vary by state. You’ll therefore want to leave these birds alone. Just about everyone loves baby animals, and spring is one of the best times of the year to see them in their natural habitats. From Yellowstone National Park to the suburbs of Philadelphia on down across the prairies of the Plains states and the rugged coast of the Pacific, spring’s warm weather lures baby animals out of nests, caves, and burrows, and into the wild. Baby animals are certainly cute, but please let them be. Feeding wild baby animals can be dangerous — for both you and the little creatures. The parents may attack you if you come near their young, and in trying to feed or touch the young animals, you may actually alter their natural behaviors, making them unable to fend for themselves in the wild. If you see any baby animals that appear to be in distress, do yourself and Mother Nature a favor and call a trained animal care specialist to intervene. Zoologists, aquarists, veterinarians, and others trained in animal care have the necessary knowledge and facilities to properly handle and treat animals in need of assistance. Butterflies colorfully dot the spring sky with fluttering bursts of color. All around the United States, butterflies flit to life during the springtime. Monarchs, meanwhile, return from their winter Mexican migration and head north throughout the country. Butterflies help pollinate flowers and drinking nectar to help stay strong so they can mate and propagate the next generation of butterflies. Of course, baby butterflies don’t look like butterflies at all — we call those little dudes and dudettes caterpillars. Caterpillars form chrysalises and become butterflies upon adulthood. Spring weather brings wildflower season. Wildflowers are found just about everywhere in the United States — from interstate highway medians to rolling hillsides, to coastal landscapes. No matter where they pop up, blooming wildflowers colorfully announce the arrival of spring and are a welcome symbol of warmer weather for the winter weary. You don’t have to go too far out of your way to enjoy the pretty sights and sweet smells of blooming wildflowers during spring weather.